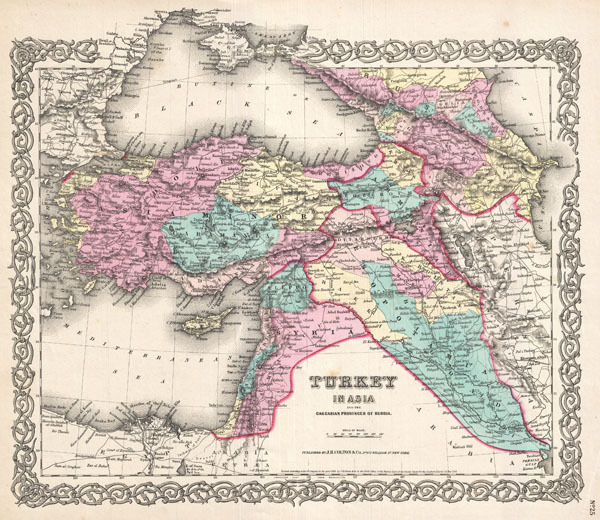 A beautiful 1855 first edition example of Colton's map of Turkey in Asia and the Caucuses. Covers from the Crimea south to the Nile Delta, west as far as the Aegean, and east to the Caspian Sea and the Persian Gulf. Basically covers the mid 19th century claims of the Ottoman Empire, however, includes the modern nations of Turkey, Iraq, Kuwait, Syria, Jordan, Israel or Palestine, Armenia, Georgia, and Azerbaijan, with parts of adjacent Iran, Greece, Egypt and Ukraine. Throughout the map, Colton identifies various cities, towns, forts, rivers, desert oases, and an assortment of additional topographical details. Surrounded by Colton's typical spiral motif border. Dated and copyrighted to J. H. Colton, 1855. Published from Colton's 172 William Street Office in New York City. Issued as page no. 25 in volume 2 of the first edition of George Washington Colton's 1855 Atlas of the World. Rumsey 0149.092 (1856 edition). Phillips (Atlases) 816.